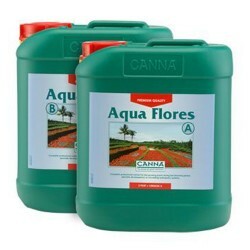 Dutch Formula BLOOM by Advanced Hydroponics creates the ultimate conditions for crop ..
Dutch Formula GROW by Advanced Hydroponics creates the ultimate conditions for crop p..
CANNA Aqua Flores CANNA Aqua Flores is a complete nutrient for plants, containing all the essenti..
CANNA Aqua Vega CANNA Aqua Vega is a fast working nutrient for plants containing all the essentia..
CANNA Coco A & B CANNA Coco A & B is a complete professional nutrient for growing plants .. The CANNA Spanner makes opening the CANNA 5L and 10L 'Jerry' Can easier. Manufacturers We..
CANNA Start is a balanced one-part nutrient for seedlings and (rooted) cuttings. CANNA Start can be .. The CANNA Tap Cap is an aid for dispensing accurately from your 5L or 10L 'Jerry' Cans. This..
CANNA Terra Flores is a complete professional nutrient for the flowering phase of plants. It is spec..
CANNA Terra Vega CANNA Terra Vega is a complete professional nutrient for the growing phase of pl..
ROOT!T Rooting Gel is the first rooting gel specifically formulated for use with growing media. ROOT..
VitaLink Coir MAX is an advanced yet easy-to-use coco coir formulation that is scientifica..